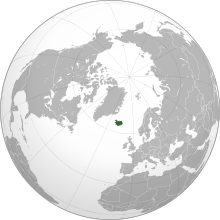 Iceland is a Nordic island country in the North Atlantic Ocean. It has a population of 348,580 and an area of 103,000 km2 (40,000 sq mi), making it the most sparsely populated country in Europe. The capital and largest city is Reykjavík. Reykjavík and the surrounding areas in the southwest of the country are home to over two-thirds of the population. Iceland is volcanically and geologically active. Iceland has a market economy with relatively low taxes compared to other OECD countries. It maintains a Nordic social welfare system that provides universal health care and tertiary education for its citizens. Iceland ranks high in economic, political and social stability and equality. In 2013, it was ranked as the 13th most-developed country in the world by the United Nations' Human Development Index. Iceland runs almost completely on renewable energy. Affected by the ongoing worldwide financial crisis, the nation's entire banking system systemically failed in October 2008, leading to a severe depression, substantial political unrest, the Icesave dispute, and the institution of capital controls. Many bankers were jailed, and the economy has made a significant recovery, in large part due to a surge in tourism. As of 2011, there are approximately 32,500 companies registered in Iceland of which 14,500 (45%) are active. A Boeing 767-300ER of Icelandair at Frankfurt Airport. Headquarters of RÚV in Reykjavík. Old whaling ships Hvalur 6, 7, 8 and 9. ^ Worstall, Tim. "If Iceland Can Jail Bankers For The Crash Then Why Can't America?". forbes.com. ^ "Áttundi hver Íslendingur situr í stjórn fyrirtækis" [One of every eight Icelanders is a member of a board of directors] (in Icelandic). 11 May 2011. Retrieved 11 May 2011. Viðskiptaráð tekur fram að samkvæmt fyrirtækjaskrá eru starfrækt 32.500 fyrirtæki en af þeim áætlar Creditinfo að um 14.500 séu virk.